Rajendra Here: How I activated GPRS in my mobile phone? 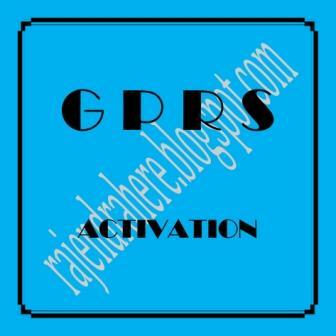 How I activated GPRS in my mobile phone? As I told I'm not a tech-expert. I'm here just to tell what I have done to activate the GPRS in my mobile phone. This is for sharing my experience and to have a note for future reference. GPRS - General Packet Radio Service - extends an internet service to GSM mobile handset. To know more about GPRS this link may be useful. How to activate GPRS setting? 1) to send the IMEI No. of the mobile handset by sms to 52586 in the format - S<space><1st 15 digit of IMEI>. Soon thereafter the Configuration will be sent to the mobile phone by sms. Open the sms, click install or use the configuration detail to configure the MMS setting. What is IMEI? How to know the IMEI No. of a handset? IMEI - International Mobile Equipment Identiy No. - is a unique number to identify a mobile handset (GSM, WCDMA) internationally. To know the IMEI No. of a mobile handset, just dial *#06# , the number will be available. Build 25 Unique Backlinks a day - Your FREE Instant Backlink Builder!